A family friend said they had been traumatised by the incident. THE FAMILY AT the centre of the Roscommon eviction case returned to their home last night. Reports from Roscommon indicate that two of the members of the family returned to the farmhouse just outside of Strokestown yesterday evening. A family friend, speaking to Shannonside radio on behalf of the family, said the they had been “traumatised” by the incident. “This family have been just thrust into the media spotlight. They’re not used to this. They’re ordinary country people… and they just want to try and get on with their everyday lives. And when I say they’re seriously traumatised they’re very nearly at breaking point at this stage and it’s a sad situation and they just want to try and move on with their lives if possible. The family moving back into the home came after an incident that took place there early on Saturday morning. Gardaí said it was an incident of “criminal damage and assault”. A number of vehicles were set alight and three of those attacked required hospital treatment. A dog was also seriously injured and had to be put down as a result. 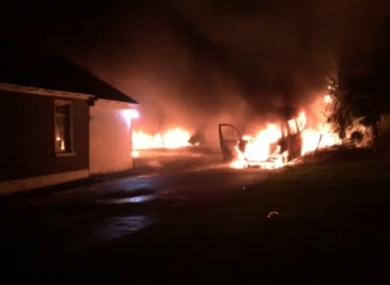 A video posted by local The Democrat Newspaper, Roscommon showed vehicles in flames at the property. The property in question had recently been repossessed and security personnel were guarding it at the time. There is no suggestion that the family in question was involved in any way with the incident. Local TD Michael Fitzmaurice last week raised the issue of the original repossession in the Dáil, which took place last week. “Yesterday in County Roscommon a group of 20 or 30 men with dogs came from the North, aided and abetted by An Garda Síochána who blocked off two roads,” he said. The group of men pegged three people, two of whom were elderly, out of a house and left them on the side of the road. “We are aware of the situation in Roscommon and that the matter is being dealt with by An Garda Síochána. Unfortunately, we cannot provide comment on individual cases,” a spokesperson said. Following the incident local TDs in the area said that violence was not the answer to the problem, but the bank should engage in negotiations with the property owners. An Taoiseach Leo Varadkar also condemned the incident yesterday, saying he was “very concerned”. Email “Siblings at centre of Roscommon eviction case move back into home”. Feedback on “Siblings at centre of Roscommon eviction case move back into home”.